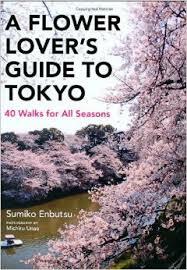 Two years ago, I gave a quick profile on Sumiko Enbutsu’s tiny but fantastic guidebook A Flower Lover’s Guide to Tokyo. As we really swing into the spring flower season, I wanted to do the book a bit more justice and hopefully give garden lovers out there (like myself) an additional resource to track down some beautiful gems not included in the regular guidebooks. Sumiko Enbutsu is the kind of person I wish I could have lunch with on a monthly basis. She used to write a column in the Japan Times on the history and hidden delights of Tokyo’s many unique neighborhoods and I have used her excellent – if rather large and unwieldy – guidebook to Tokyo to make some great discoveries. With A Flower Lover’s Guide, however, she caters to those of us who prefer blooms to boring historical dates and her garden choices are accessible for even casual visitors to Tokyo. The book is broken into chapters or sections according to flower, beginning with cherry blossoms. Enbutsu includes flowers and trees that can be seen year-round, so even winter visitors can enjoy tracking down camellias and plum blossoms, while summer travelers will revel in hydrangea, irises, morning glories and lotuses. The sections all begin with a short history of the flower in Japanese culture. The wisteria, for example, has long been a popular and romantic flower associated with the Imperial court and even revered by the powerful Fujiwara clan, whose own name means “wisteria field”. The lotus is a sacred flower in Buddhist art while also being a popular motif on Japanese tombstones, as it symbolizes rebirth after death. Enbutsu then provides two to four locations where each popular flower can be seen. Some are centrally located, such as the Iris Garden at the Nezu Institute of Fine Art or the azaleas at the Imperial Palace East Gardens. Others require a bit more effort, like the lilies in Saitama’s Musashi Kyuryo National Park. In the case of day trips to the surrounding prefectures, the author includes a map of the area as well as an estimation of the time needed to visit the site. The book is small, portable enough to slip into a shoulder bag or purse and carry it along with you as a reference on your garden visits. Interestingly, the author overlooks several obvious sights – such as the azaleas at the Nezu Shrine in the Yanaka neighborhood – but that just makes her finds a bit sweeter, as they’re not as well-touristed or blogged about as the more popular locales. I’m excited to be moving to Tokyo this summer, where I will give this book a more prominent place on my shelf. Even for a seasoned Japan-hand and die-hard garden researcher like me, there are enough finds in this guide to occupy me for quite a few days in the coming year.